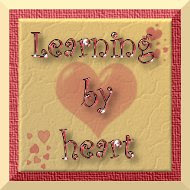 Learning by Heart – week 7 | Tired, Need Sleep. Geoboard with colorful binders. I bought the geoboard from Amazon last summer, and the hair bands are from Dollar Tree. I remember making these suncatchers when I was little, and I LOVED them. This is the kind that has tiny plastic beads which you put into the metal frame, then bake in the oven. I found some at Michael’s, and bought them up. M tried his first one this week. It was on his shelf as just a fun item, but I had him pinch the beads to place them where he wanted, so it ended up being a good fine motor activity too. There were a lot of beads left over, so we got out some metal cookie cutters, placed them on a cookie sheet, and M used the left over beads to fill them up. After they baked and cooled, I popped them out of the cookie cutters: With a hole, and different cookie cutters, these would make fun Christmas ornaments to give the grandparents, don’t you think? We’ve been playing a lot of Mancala lately, so this was out on his shelf too (although it wasn’t really an independent activity): Mancala is a great game for counting to higher numbers too, because at the end of the game all of the stones have to be counted. It took M a couple of games to really understand all the rules, but he picked it up with no problem. We’ve been having a lot of fun playing this! Thanks to The Adventures of Bear for this wonderful idea! We played a “go fish” style game with our ABC cards. We asked each other for the big or little letter of one we needed for a match. When M wasn’t sure, I was able to help him out by saying the name of the thing pictured on the card. We did all 26 letters, and this game lasted a loooong time! A little counting game I came up with on the spur of the moment, which ended up being the hit of the week: I grabbed our number cards, some dried beans, and a pillowcase. The cards went into the pillowcase and we took turns pulling one out (no peeking!). We had to set the card on the floor, turn it over to the counting side, and count beans onto it. We used cards 0 through 15. After all the cards were out of the pillowcase, we counted the total number of beans for each person. The winner was whoever had the most beans. We have learned a lot about Mr. Pill Bug. His skeleton is on the outside of his body where we can actually see it, and it protects him. He can curl up into a ball when he’s afraid, and then he is completely protected. He likes damp areas. He likes to climb on rough rocks and hide under them. He does not like smooth surfaces, like the inside of a bug catcher or say, a glass jar that he can’t climb out of. He loves to eat decaying leaves and wood and maybe even pieces of shredded carrot. Frankly, I’m pretty sure we are slowly killing Mr. Pill Bug because he really doesn’t seem to be eating even though I’ve researched as much about him as I can (er… want to). I’d love to set him free (outside, mind you) but then M’s heart might break. I’m thinking the jar may just tip over and he may escape one of these days. Part of me says “ew”. And part of me says “poor Mr. pill bug” and part of me says “I’d really rather have a dog”. We also did a fun science experiment with balloons, which I posted about earlier. Well, when we began this year, I had mapped out activities based on one or two “letters of the week”, with math activities coming from the Montessori bead bars and number boards lessons. Other than this, I planned on focusing mainly on fine and gross motor skills, art, and a fun science experiment here and there. Really it was the math lessons and alphabet activities that were propelling us through the weeks. Now that M has officially rejected the Montessori math lessons, and isn’t into the letter crafts, or even our phonics boxes very much, I’m having a hard time feeling like our weeks have any focus to them. I’ve been haphazardly gathering ideas from a variety of places, and trying to be creative with making up new activities that aren’t too time-consuming to create (all the time keeping up an internal dialogue about how this isn’t really as important as I’m making it – sigh). Have you seen the link-up thingy on http://littlehandsbigwork.blogspot.com/ ? It's more or less a weekly thing on wednesdays and your posts would be perfect! Unit studies do take so much time, but they can be worth it. LOVE the suncatcher, Christmas ornament idea! And the counting game. And I've been wondering whether Mancala would be too much for Crumpet. I played years ago and thought it was fun, but didn't remember enough about it to know if a 4 year old could play.Yay, I'm going to run out and buy it. Great ideas !! Can you please tell where did you get the pattern cards from? M really loves them when I bring them out. I need to find more patterns for him. Prekinders.com has some printable patterns, if you are interested!